Pasta, rice, and bread, three things I thoroughly enjoy eating. However, I decided to embark on a month-long experiment of cutting out these three foods from my diet. Just these three food types, not all carbs. I still consumed things like cereal, crackers, oatmeal, sweets, and alcohol. Not to lose weight per se, but to see if my body would feel any different, change at all, or have any changes in digestion and bloat. My good friend Melissa decided to partner up with me for this adventure of sorts and we kicked it off on April 1st with a bang! Melissa describes her take on our adventure a bit later in this article. I jotted down my weight and took a before photo and got things started! My very first food metamorphosis came with breakfast. I typically make an egg, cheese, and avocado slice on an English muffin which is a delightful combo of protein, fat and carbs. 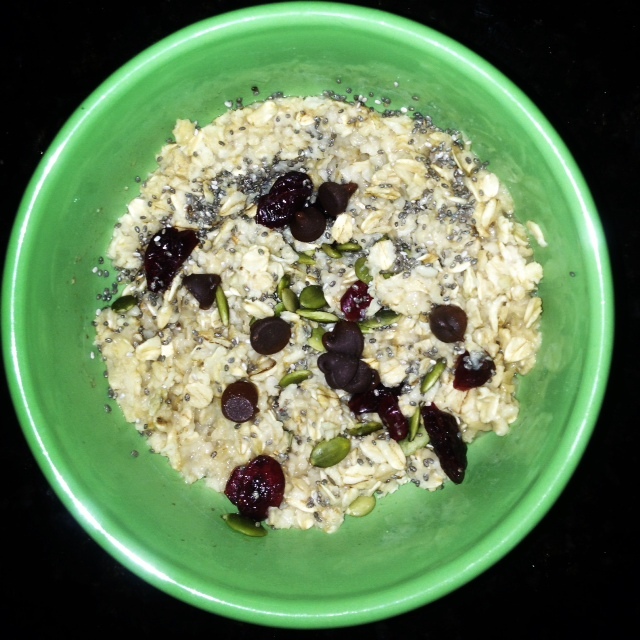 Since my English muffin was no longer, I would instead have a bowl of Quaker Quick oats oatmeal with some cranberries, sunflower seeds, chia and/or flax seeds and a drizzle of honey; I would also sometimes add a few dark chocolate chips into the mix. Sometimes I would have an egg with cheese and avocado on these little pistachio/rosemary crisps. I still felt full and satisfied throughout my morning. Lunch was the largest change for me. Usually I am eating lunch in my car on the road in between clients, so I typically pack a peanut butter on raisin bread and a yogurt and some grapes. Easy to pack and eat on the road. I now swapped my sammy for a salad. Usually I would not have any protein on my salad so would have a spoonful of peanut butter mid afternoon. Dinner was also a big change for me as we often have rice as a side. I got used to having two veggies as sides and felt full and content. 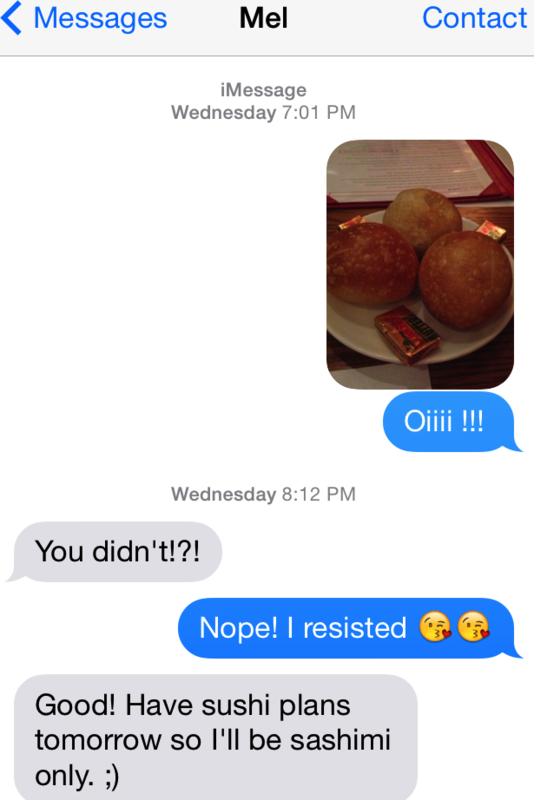 For me it was very hard resisting warm rolls while out at restaurants, but I stayed strong and resisted temptation. It helped doing this challenge with Melissa to have an additional layer of accountability and to help one another stay on track (and also to fess up to when we occasionally slipped up (yes we are human and Easter feasts were in April)! Here are some snip its of some of the words of encouragement between Mel and I. When the cleanse came to an end on April 30th I took my weight and photo. I had lost one pound and saw a bit more definition in my mid section. 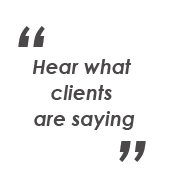 I felt less bloated and my digestion seemed better. I also felt more full when not eating these types of carbs and never felt that gross overly stuffed feeling post-meal. I did not feel the urge to snack as often between meals, and when I did I would opt for things like oven-roasted pecans that I drizzled with a little melted Brummel Butter, sugar and honey. 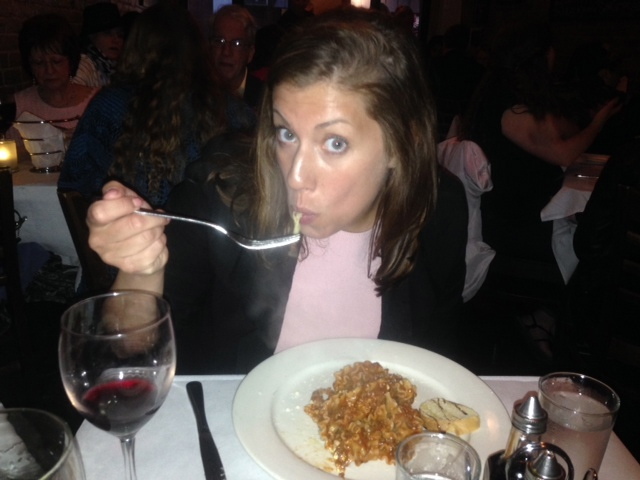 A week later, Melissa and I celebrated a successful cleanse reward by having pasta meals in the North End. 1) I am more conscious of my bread, rice, and pasta intake and limit them without fully eliminating them. 2) I no longer have a sandwich for lunch and go for a salad. 3) I am able to resist bread at restaurants now much more easily than before, it helps when you tell yourself you want to save room for your entrée rather than filling up on bread before hand. I am now two weeks post cleanse and have lost another 3lbs just by making these simple carb modifications/choices to my eating habits. I have not altered my fitness regiment at all. The moral of this experiment, from my point of view, is this… A) you can accomplish any challenge you set your mind to and B) it’s OK to have occasional slip ups along the way, life is not an all or nothing dichotomy, just get back up on the saddle and get right back at it, and C) having peer support, a friend to help keep you motivated and to share laughs and experiences along the way, really helps you to stay on track. So, what’s your next challenge going to be?! That’s my take. Here is Mel’s! 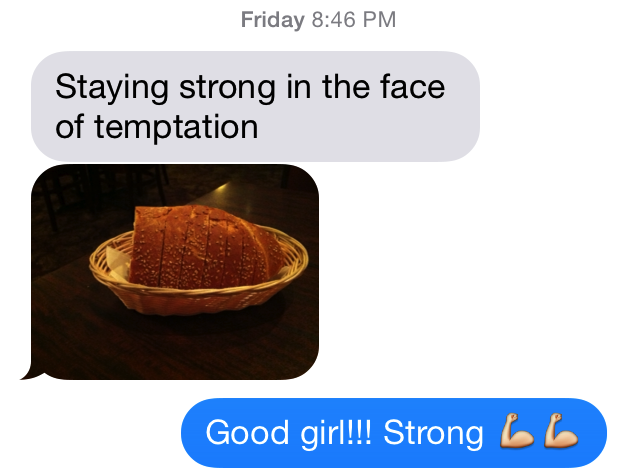 On April 1st I just happened to text Jen, my favorite fitness expert friend, for some advice. I had been working out and losing weight, but looking to accelerate my results, in particular to try to get rid of the belly bulge that seems to linger around. Coincidentally, she was starting a carb cleanse challenge for the month of April: not eating any pasta, rice or bread for the whole month. I was immediately intrigued and agreed to join her. Luckily I already hadn’t had anything off limits that day and was ready to go with a clean slate. She suggested we keep in touch via text and email to keep each other motivated and accountable throughout the month. Unlike me, Jen doesn’t have weight to lose but wanted to cut down on bloat and enjoys a good challenge. It was motivating to know that I had Jen to check in and commiserate with. As the first week passed, Jen and I had a few discussions about the definition of our restricted items and allowed for some compromises. Crackers, for example, were considered OK. Pizza isn’t bread per se but felt like cheating. Even though it was a carb cleanse, sweets were permitted because we didn’t want to eliminate too much at once and set ourselves up for failure. I confronted my first test only two days later when I had dinner plans with some friends at a sushi restaurant. Normally I would have gone right for the maki rolls, but luckily the menu was expansive. We ended up having a spicy seafood appetizer, and I ordered a grilled veggie and seafood dish and was perfectly content without maki. 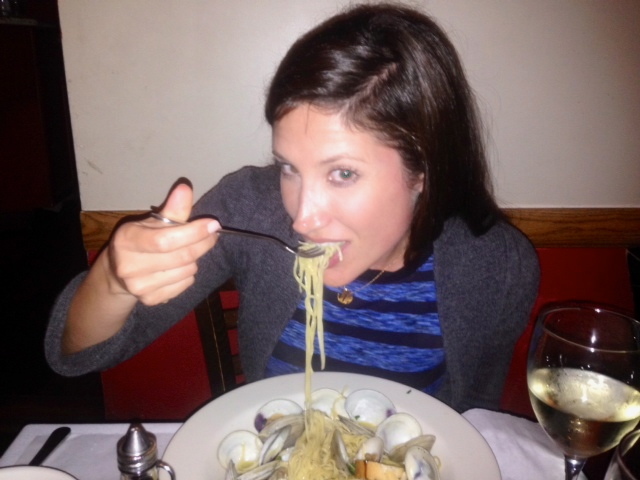 Then another few days later I went along with my husband’s craving for one of our favorite local Italian restaurants. 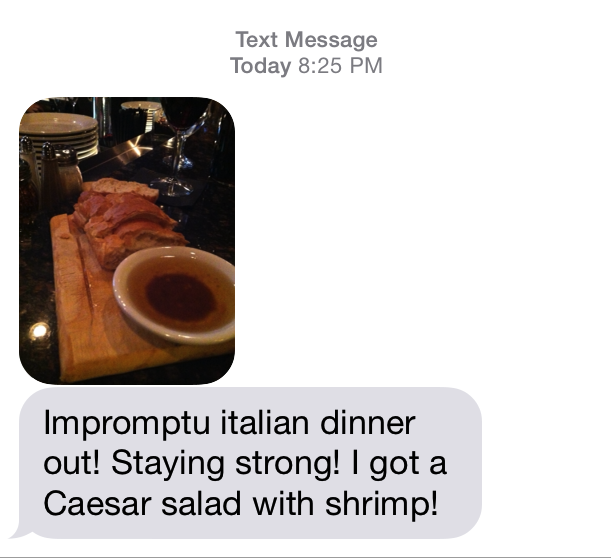 I watched with envy as he enjoyed a homemade fusilli dish, but did truly enjoy my salad with grilled shrimp. OK, I had ONE fusilli. Literally one! That hardly counts as cheating. The second week of this challenge I wanted to really step up my game. I decided I would eliminate all sweets and crackers. Crackers are tough for me because they serve largely as an accompaniment for cheese, my favorite food in the world. I figured I was killing two birds with one stone on that one. It was during this week that I really started to see some material results. Combined with varied exercise including Spinning classes, playing squash, and weight training, I was noticing a real difference in the way I looked and felt. I had a lot more energy and liked the way clothes were fitting. This progress was very motivating and surprisingly I did not feel deprived. I think that gradually restricting foods rather than going immediately on a highly modified diet helped with the ability to acclimate to the changes. I also found I was enjoying having some different options with meal planning and dining out. Dinners at home were typically grilled lean protein with a side of veggies and many dinners out were salads with grilled meat or seafood. I was impressed with my improvisation skills, including one day when I forgot my usual egg and fruit for breakfast and ended up pulling the turkey bacon and egg off of a Starbucks sandwich. At our work café, I started asking for the protein topping from whatever the sandwich of the day was on top of my veggie-loaded salad bar selection. Eating lots of greens kept me feeling full, as did drinking copious amounts of water. And wine. (Just kidding! I do love my wine though.) I was even able to resist some very delicious looking birthday cake on two separate occasions, and made it through a baby shower that had a a smorgasbord of tempting treats with just a bite of some frosting from an éclair. I learned having a tiny little taste of something was sometimes enough to quiet that voice of temptation. Other times I really didn’t feel the temptation at all. During the third week, Easter rolled around and delicious little egg shaped candies started appearing around my house. My “no sweets” addition to the challenge gradually disappeared in a peanut butter and chocolate induced haze. For the bread, rice and pasta, I stayed true to the challenge until the end. Well, except for one cheat. I had dinner with a client at a seafood place and couldn’t resist a baked stuffed lobster (loaded with bread crumbs) and some delicious cornbread. The following day I felt lethargic and bloated, and had a headache. I think I would have felt fine if I had eaten in moderation, but I really got carried away and over ate. After confessing the binge to Jen and dealing with the carb hangover, I felt confident that I could make it through the rest of the challenge without incident. Jen had also cheated a little too, so it was a consolation that I wasn’t the only one taking a bit of a fall off the wagon. I did manage to make it through the entire month without pizza, which was quite a feat since pizza tends to be my go-to “I don’t feel like cooking” dinner. As of May 1 I had lost 9 lbs and 2 inches off my waist. I have a way to go toward my weight loss and fitness goals, but this challenge motivated me on that journey in many surprising ways. There were lessons about moderation, discipline, and the power of peer support. And about the many delicious and nutritious things to eat that can replace the empty white carbs that tend to creep in and fill up our caloric intake. I am planning to continue restricting these foods even after my fitness goals have been accomplished. Of course, indulging in moderation will always be a part of what I see as a healthy lifestyle. Thank you again found this useful and motivating.